I was trying to look how my app looks in material design and I would like to use the new cards lib. My Problem is, that it's giving me this error within my gradle file and I need to fix that. And set the path to the "SDK location" Preferences in Android Studio under "JDK location". But it's not working -- it seems that it still can't find JDK 7. I'm using Mac OSX 10.9.3 and Android Studio (Beta) 0.8.1. 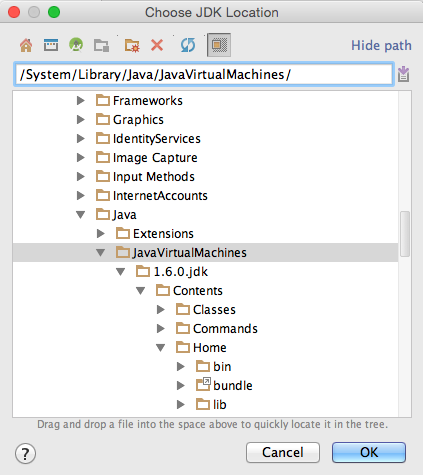 Setting the directory to: /Library/Java/JavaVirtualMachines/jdk1.7.0_60.jdk/Contents/Home in JDK settings solved my issue. I had the same problem getting started up. Hope this helps! Click on DMG and follow the instructions . 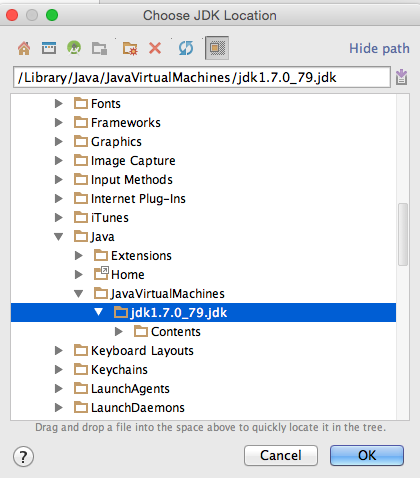 It will install and configure JDK-7 on mac . Now in your android studio go to File->Project Structure -> SDK Location . The other answers are very correct but I want to be more concise and clear. To prevent others from visiting this page multiple times unnecessarily. Open your project and go to File->Settings. Under the Project Settings, expand Compiler and go to the Java Compiler option. You want to use javac and set the project bytecode version to 1.7. Not the answer you're looking for? Browse other questions tagged java android macos android-studio or ask your own question.